Just a little reminder 401 years ago today Guy Fawkes Night occured, and even Wikipedia is listing the V for Vendetta movie(which is closely connected to the movie) as their featured article today. See my last post on V for Vendetta, and it is available on DVD. Good evening, London. Allow me first to apologize for this interruption. I do, like many of you, appreciate the comforts of every day routine- the security of the familiar, the tranquility of repetition. I enjoy them as much as any bloke. But in the spirit of commemoration, whereby those important events of the past usually associated with someone’s death or the end of some awful bloody struggle are celebrated with a nice holiday. I thought we could mark this November the 5th, a day that is sadly no longer remembered, by taking some time out of our daily lives to sit down and have a little chat. There are of course those who do not want us to speak. I suspect even now, orders are being shouted into telephones, and men with guns will soon be on their way. Why? Because while the truncheon may be used in lieu of conversation, words will always retain their power. Words offer the means to meaning, and for those who will listen, the enunciation of truth. And the truth is, there is something terribly wrong with this country, isn’t there? Cruelty and injustice, intolerance and oppression. And where once you had the freedom to object, think, and speak as you saw fit, you now have censors and systems of surveillence coercing your conformity and soliciting your submission. How did this happen? Who’s to blame? Well, certainly there are those more responsible than others, and they will be held accountable, but again truth be told, if you’re looking for the guilty, you need only look into a mirror. I know why you did it. I know you were afraid. Who wouldn’t be? War, terror, disease. There were a myriad of problems which conspired to corrupt your reason and rob you of your common sense. Fear got the best of you, and in your panic you turned to the now High Chancellor, Adam Sutler. He promised you order, he promised you peace, and all he demanded in return was your silent, obedient consent. Last night I sought to end that silence. Last night I destroyed the Old Bailey, to remind this country of what it has forgotten. More than four hundred years ago a great citizen wished to embed the fifth of November forever in our memory. His hope was to remind the world that fairness, justice, and freedom are more than words, they are perspectives. So if you’ve seen nothing, if the crimes of this government remain unknown to you, then I would suggest you allow the fifth of November to pass unmarked. But if you see what I see, if you feel as I feel, and if you would seek as I seek, then I ask you to stand beside me one year from tonight, outside the gates of Parliament, and together we shall give them a fifth of November that shall never, ever be forgot. Thanks for subscribing to my feed! V for Vendetta – Vive la revolucion! Our second Burlington Libertarian Party Event! We headed out on Friday to see ‘V for Vendetta’, starring Hugo Weaving and Natalie Portman. I feel it is a prime example of what can happen when government oversteps its bounds, and interferes with society… it’s like a modern day ‘1984’, and even has the main actor from ‘1984’ in it (John Hurt), ironically as the main bad guy. 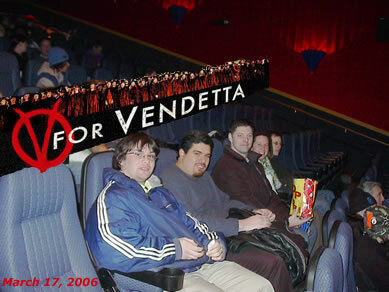 Last night, Hardy Machia, Bonnie Scott, Kevin Ryan, Jonathan Stauffer, Heavenly and I went out together to see the movie V for Vendetta, another great movie from the people who brought you The Matrix. Again, the Wachowski brothers have created a Libertarian-themed movie where a small group of people are fighting to reduce the power of an oppressive government and to open people’s eyes to it. “V for Vendetta is based on a graphic novel by Alan Moore that is set in England in 2020. Great Britain is under the control of a fascist government who use fear and intimidation to control its citizens. The government controls the media and clamps down on free speech through its Ministry of Objectionable Materials. A mysterious rebel known as V, who is dubbed a terrorist by the Hitler-esque Chancellor Sulter, plots to overthrow the government. V seeks to complete 17th century saboteur Guy Fawkes’s mission to blow up Parliament, as way to spark a rebellion. Of course, I recommend everyone to watch it, to fully appreciate the movie, and it’s significance. It’s rated R due to ‘strong violence and some language’, so it’s definately not one to bring the kids to see… but it is a great action – suspense movie to watch on the big screen! Ice & snow sculptures coming to Burlington this weekend! I’m an Influenster, are you?